So what are the different religions views on Abortion? We will be looking at Christian and Hindu views. As well as giving you an overview of the key facts about abortion in the UK and social reasons for and against abortion. No actual bible teaching mentions the word abortion. Life begins at conception – the foetus is a human being with human rights. 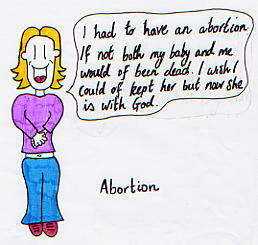 All bible teaching on human life also applies to the foetus – especially the commandment (6th) ‘Do not kill’. If a mother can not support her baby then it should be adopted. Life is sacred because it is given by God – ‘created in the image of God’ (creation story). Life does not begin until the baby has a chance to survive independently from the mother. Abortion is wrong BUT justifiable if there was a chance of greater harm to the mother, or if she had been raped. Should be left to the woman’s conscience, which will be guided by God. The decision to continue a pregnancy should not be forced on the woman. Let’s look at Hindu teachings. Many different views on abortion among Hindus. Some are totally opposed to abortion, others use the teachings of leaders like GANDHI on AHIMSA (violence only to be used as a last resort and avoided wherever possible) to show it is allowable if the mother’s life is threatened. Abortion is available on demand in India (83% of pop Hindu) and 5 million abortions carried out each year. Some base their approval of Abortion on teachings of KRISHNA in the Holy Book the Bhagavad Gita that you can not harm the soul – therefore if an abortion is carried out the soul is simply born into another body.